Obituary for Robert Thiessen | Langeland Family Funeral Homes, Inc.
Robert John Thiessen, 87, passed away on April 18, 2018. He was born on November 13, 1930, in Kalamazoo, Michigan, to Peter P. and Mary Caroline (Armit) Thiessen. Bob was a paper chemist until he retired from Allied Paper Company in 1986. 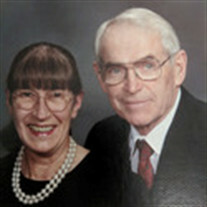 Mary Lou (Porter) Thiessen, his wife of 61 years, preceded him in death by 26 days. Bob was also preceded in death by his only sibling, Peter A. Thiessen. He is survived by his daughter, Sunny (Thiessen) Hicks and his son, Dale (Amy) Thiessen. Also surviving are his beloved grandchildren, Jennifer Hicks, Scott (Michelle) Hicks, Zachary Hicks, Joshua (Amanda) Hicks, Gabriel Hicks, Jacob Thiessen, and Hannah Thiessen; and his great-grandchildren, Chaney Hicks, Chase Hicks, and Kate Hicks. Cremation has taken place and Robert and Mary Lou will be interred together in Mt. Ever-Rest Memorial Park, South at a date and time to be announced later.